What can I say about this book that hasn’t been said before? So I’ll keep it short. I was introduced to Neil Gaiman by Hugh when he mentioned Stardust a long time back. After that I kept reading about what a great author he was on other book blogs. I bought Fragile things and tried to read it. I loved the few stories that I read even though I found them a little weird. But my attention span for short stories is very limited and I left the book half read. After that I kept searching for The Graveyard Book after reading rave reviews but in library it was always checked out and those in book stores are expensive. To cut the long story short, I finally gave in and bought this book; and I LOVED it. Neil Gaiman is everything that everyone has said and more. For me The Graveyard Book was mostly a coming of age story than a fantasy. For those who haven’t read it, it’s a story of a boy called Nobody Owens. His entire family is killed one night and he, as a toddler, wanders into the graveyard and is saved by a ghost couple Mr and Mrs Owens. Silas, who is neither dead nor alive and who lives in a crypt in the graveyard agrees to be his guardian and bring him all the necessities. I loved the world Neil Gaiman has created in this book – all the ghosts in the graveyard, the atmosphere, the blue tattoo man and the ghouls gateways. Everything was so fascinating even if it was in a story. Most of all I loved Bod, loved seeing him grow up and eager to explore and know more about his surroundings. I also loved his adventurous and fearless spirit, although you probably think that’s not much considering he grew up in a graveyard. There is something magical about Neil Gaiman’s writing, it’s as simple as it can get but it also has great depth. I wonder whats next for Nobody Owens, hopefully Mr. Neil Gaiman will let us know in a sequel? I am eager to experience more of Gaiman’s writing. What should I read next? 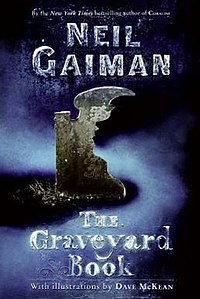 This entry was posted in Books, Books read 2011, Fantasy, Reviews, Young Adult and tagged Neil Gaiman, The graveyard book. Bookmark the permalink. Most definitely read American Gods, it’s the first one I read and I loved it! Then maybe Neverwhere – a great take on London! I’ve seen this book around, but have be skeptical about picking it up. I say I’m going to read this every October – maybe this year will be the magical year. This is first and only Gaiman book I’ve read. I adored it. I hope to read more Gaiman. I’ve been meaning to get my hands on this one! Thinking I might try to listen to it sometime. I really really recommend Stardust. I’ve also read Neverwhere and enjoyed it but not as much as Stardust. I need to pick this one up. I got it from the library in the way-back-when but never had a chance to read it. Gaiman can be hit-and-miss with me. I couldn’t get into Stardust at all, but I loved Nevermore (you should definitely read that one) and Odd and the Frost Giants. There’s also an awesome short story by him that you can get for free on the interwebz called A Study in Emerald. I love this book, too! I love every book I’ve read by Gaiman (Though Anansi Gods not QUITE so much as the rest). Bod was such a kind person- he was great to cheer for. It is always good to read lots of different reviews about a book, as everyone sees things from a slightly different perspective. I have read lots of good reviews about this book, although I have to admit that I have never read anything by Neil Gaiman. Checking him out, he is such a prolific author, that I am sure you wil have no difficulty in finding more of his work to read. I loved this one and I’m so glad you do too, Violet! It’s a great book! I just picked this one up last week at the Border’s sale. Looks like I should read it for the RIP Challenge. I am so glad you enjoyed this! I have read many positive reviews on this one so it’s a mystery that I haven’t started reading it yet.